As we move around in the world we develop a sense of how to get from A to B. This relies heavily on the hippocampus, a brain structure nestled deep within each of the temporal lobes, responsible for many functions vital to cognition such as memory and navigation. This is the brain structure famed for becoming physically larger as a result of all the practice driving around London that the drivers of London’s famous Black Cabs have to accrue before they can pass “The Knowledge.” Whilst their memory for the 25,000 roads and 20,000 major landmarks that enable them to instantly reel off the route they’d take to get from one place to another is extraordinary, for the 33% of those born in 2015 will live long enough to develop dementia at some point in their lives this situation is reversed. 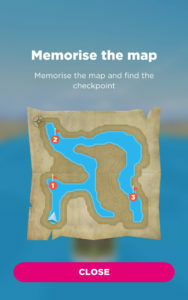 Difficulties with navigation, even familiar routes between places visited many times before, is one of the problems in daily life that can herald the approach of full-blown dementia. Understanding the normal trajectory of changes in navigational ability over the lifetime of a health brain is a vital first step. With or without dementia our abilities to memories complex routes becomes slowly but surely compromised by the normal processes of age-related cognitive decline. We need to know what is normal for each age group before we could be in a position to use a steeper than normal decline in navigational ability as an early warning signal, ideally before any memory deficits have had a chance to rear their ugly heads. As our understanding of the metabolic processes that lead to various forms of dementia improve, this early warning could prove to be a vital mechanism in triggering prophylactic treatments early enough to slow down disease progression. Personally I was surprised by how hard some of the levels were. 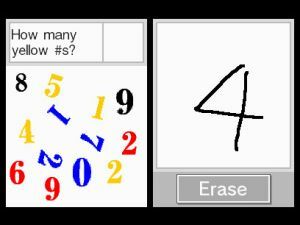 I play a lot of brain training games (e.g. PEAK Review, BRAIN AGE 2 Review ), just to keep myself up to date on the latest offerings, and am now accustomed to finding myself able to get maximal scores on most categories of games pretty quickly through daily play. Not Sea Hero Quest. Once I got past the easier earlier levels, I often found myself getting lost in the mist, or going round and round in circles having forgotten how to get from buoy 3 to buoy 4. As a consequence, not only did I help scientists like Hugo Spiers and colleagues from the University of East Anglia and Alzheimers Research UK to generate data (anonymously, you only have to give your age) but I also got an insight into what the future might have in store for me should I become one of the unfortunate 1 in 3 that get clobbered by dementia in my post-retirement years. As you progress from level to level you periodically get to chase down one of a large variety of sea monsters. Having dodged innumerable obstacles along the way the monster in question eventually leaps out of the water at you and your task, is to resist the temptation to hit the button on your camera to take a photo of the rare and exotic sea beast in question, until the very last second when the captured image is at its most aesthetically pleasing. 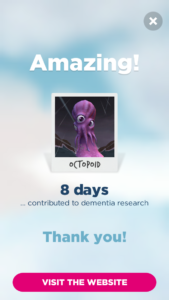 Overall, I found playing this game great fun, very challenging at times and doubly satisfying knowing that it would, in some small but meaningful way, help science to get some much needed answers about how the human brain keeps track of where it is and where it’s going in health, so we can better understand when this system breaks down in disease. I would just like to take a moment to applaud @HugoSpiers and collaborators for finding a way to genuinely enable people to #gameforgood. Hats off to you all… your Cannes Lion was thoroughly well deserved! In addition to these monthly blogs you can get daily brain tweets about other amazing developments in the world of neuroscience by following me on Twitter (@DrJackLewis). And for a fortnightly appraisal of the latest quirkly stories from the wonderful world of science on general there’s always the totally free Geek Chic Weird Science podcast available from iTunes, Podbay, Libsyn and many others. As my regulars will know I like to keep abreast of movements in the brain training game market. 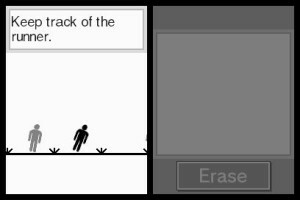 I’ve reviewed Nintendo DS’s titles from the Dr Kawashima, Lumosity and even some that weren’t specifically designed to improve cognitive functions, yet arguably do. Christmas before last I subscribed my parents up to Lumosity on the iPad. 24 months later my dad still plays on a regular basis. He’s up to 99.9% for his age group in every category bar 1 (where he is up to 99.7%!). This year I’ll be subscribing them to PEAK instead, because having regularly used it on my phone to kill time whilst in transit (or on the throne) for the best part of a year I genuinely think the (relatively) new kid on the block wipes the floor with Lumosity. All the major players tend to include a core set of “classic” brain training games that are clearly inspired by neurological tests that have been around for many decades e.g. Go/NoGo, Stroop, N-back etc. Unlike their rivals who seem to be happy with the basic versions, PEAK seems to continually evolve each game by adding a twist or making each game a little bit tougher. Take for instance working memory training – the only games for which there is any half decent published data in the peer-reviewed science literature supporting claims that it can actually improve cognition (and even that evidence is hotly contested!). The spatial working memory training games like PERILOUS PATH (memorise the position of the mines whilst they’re briefly displayed and then trace a path around them from random start to finish points), MEMORY SWEEP (remember and reproduce the position of illuminated blocks in larger and larger grids) and BOUNCE (guess the finishing point of a laser beam sent bouncing across angled mirrors distributed across the grid after a brief glimpse of where they are) have all been done before, but these are all great versions. TUNNEL TRANCE – progresses from the 1-back task to the 2-back (same as the image before last?) to the 3-back (same as the one before the one before last) – this really has the potential to genuinely help people hold more information in mind when they are performing a real life task. It probably goes up to 4-back and beyond… if so, I simply haven’t performed well enough at the 3-back task to get promoted to the next level. A common symptom of depression is the tendency to ruminate over negative thoughts or emotions. An effective but simply remedy is to develop the habit of dwelling instead on the positive whilst disregarding the negative. Bear this in mind as you read on because I’m convinced that HAPPY RIVER can only be a power for good, which suggests that PEAK really are keeping an eye on the latest developments in psychology and neuroscience to find inspiration for their new game pipeline. HAPPY RIVER involves reuniting a baby elephant with its mother. They are on opposite side of the banks of a river that have several rows of words streaming across it either from left to right or right to left. Each of the individual words acts as a raft. By tapping the screen the baby elephant hops forward. Your timing has to be accurate or else you’ll fall into the gaps between each word raft. You also have to be strategic because only those words with positive emotional overtones provide safe passage. Step onto a negative word and you’ll be tipped over into the rapids. So to successfully reunite the baby elephant with its mother you have to focus on the positive and avoid the negative – hence PEAK have created a game that could well encourage a habit that could ever so slightly nudge players towards a more positive outlook and greater mental health. FLIGHT PATH challenges many different cognitive capacities. You start with a bird’s eye view of some lush green fields at the middle of which are 4 landing spots for airships that fly into view from top, bottom, left or right of screen. 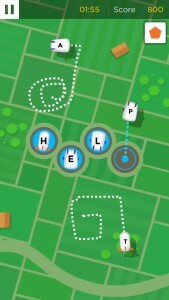 Each airship has a different letter and moves at a different velocity. Your task is to plot the movement of each airship so that they line up on the ground in an order that spells a 4-letter word. The airspace can get pretty crowded so half the challenge is to do what all air traffic control professionals do so well – stop the aircraft from smashing into each other and showering the sky with debris. For this game you need to think strategically, flexibly, linguistically, constantly updating the flight paths for a steadily increasing number of craft whilst simultaneously keeping your eye on an icon in the top right corner to win extra points. Although there is no published data yet to prove it, my hunch is that having to divide your attention across so many competing concerns and continually re-evaluate your priorities, will tune up brain pathways that would surely come in useful for any high pressured professional. In addition to these monthly brain blogs, you can subscribe to my weekly science podcast (or get it on libsyn) and follow me on Twitter (@drjacklewis) for a daily dose of news articles describing the latest breakthroughs in brain science. I would argue that, purely in terms of short-term arousal (Steady! In your brain.. not your pants), it is really quite effective. Based on personal experience I have found that 10-15 minutes spent taxing various mental abilities with the higher levels of any of these games is a more effective way of getting going in the morning than a slug of strong coffee. So even if the evidence does not mount up to support the claims of Lumosity, Cognifit and Torkel Klingberg regarding long term cognitive benefits for everyday people that might help them in their daily life, I think it would be pretty hard to refute the claim that challenging your brain to solve a few puzzles first thing in the morning can really help you hit the ground running each and every day. Anyway, I digress (again). What I like about Brain Age 2 is that it is really hard; punishingly hard at times. In one game you have to keep track of a stickman’s position in a running race as other runners are overtaken / overtake you. In another your task is to keep track of blocks that pile up on each other as they fall behind a screen recalling the height of one particular column. Both are good solid working memory training games (and thus have the best potential to boost IQ; read this book for full explanation) and have a nice progression to them in that they start easy on the earlier levels, build the difficulty gradually, but soon end up challenging even the sharpest of brains. Other new games are not so challenging. “Days and Dates” and “Correct Change” are clearly built with the aim of developing cognitive skills that have an obvious practical application in everyday life. I suspect these might have been included to address criticisms leveled at the brain training market by suggesting that the games only help people get better at the specific task being tackled. Either way, figuring out what the day was 4 days after 2 days ago, or figuring out the correct coins to give as change if a £/€/$1.40 bill was paid with a ten pound/euro/dollar note, are a pretty dull ways to pass the time, if you ask me. 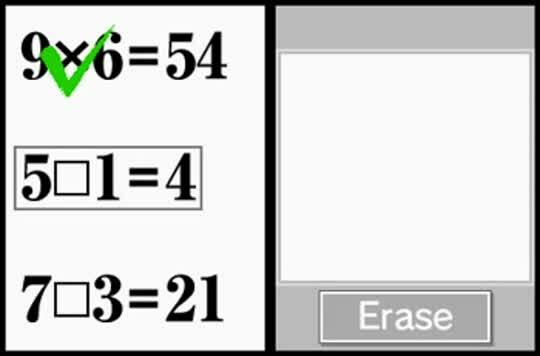 “Missing symbols” – adding the appropriate plus, minus, multiplication or division sign to make the sum work – verges on the dull, but the speed element keeps it challenging. You can always go faster. 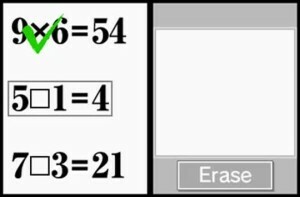 “Memory addition” takes mental arithmetic to the next level by having to perform a calculation but then keep one of the numbers in mind to use it in the next sum. I must admit to hissing the to-be-remembered number under my breath (recruiting the “phonological loop” aspect of working memory) so as not to get confused with the correct answer for the current sum. “Word Scramble” is cute. Solving an anagram where the letters are not just shuffled but are presented in a ring that slowly rotates. Surprisingly tough, particularly with the longer letter strings! 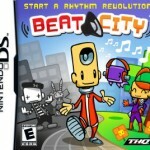 Anyone who has read my review of Beat City will know I am a fan of games that involve making music. So it will come as no surprise that I think “Masterpiece Recital” is brilliant. A little bit pointless for people that actually play the piano, but great for the rest of us. You have to hit the right note on a piano keyboard as the musical score scrolls past. 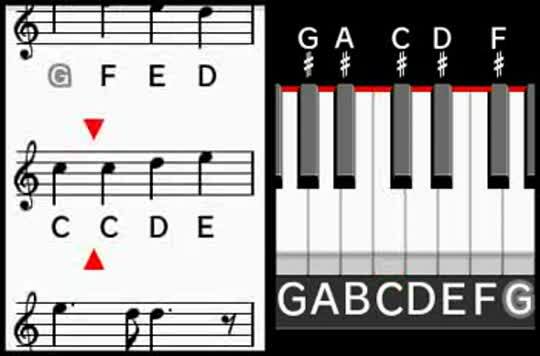 And you don’t have to be able to read music as it labels both the keyboard and the music notation with the appropriate letter (see left). The reason I found it so satisfying is because in the later levels the tunes are really beautiful pieces of classical music (and I’m no classical music buff, that’s for sure) plus the accompanying backing music makes even the most amateurish efforts sound pretty good; even if you’re a bit late hitting the notes. You get marked down for this at the end, but whilst you’re in the game it very enjoyable to feel like you are actually creating such pretty music. “Word Blend” is a good idea, but poorly executed. It’s loosely based on the dichotic listening test (usually different information is presented to each ear) – straight out of the psychology textbooks – whereby 2 or 3 voices simultaneously say a single word and your job is to recognize the words and write them down. Personally I just found this game irritating. 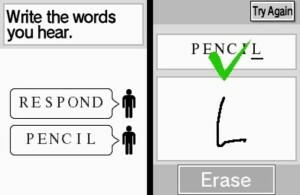 Despite having the option of hearing them repeat it five times or so (but you only score points for words identified without hitting the repeat button) it can sometimes be quite impossible (for me at least) to hear one voice over the other. I suspect it is the fault of the game rather than the player because there was no improvement. So I’m either acoustically challenged, or this particular game is a bit crap. The game I liked the most, despite upon first encountering it that it was a bit remedial, is a game that seemed to be inspired by exercises developed to help people overcome learning disabilities. 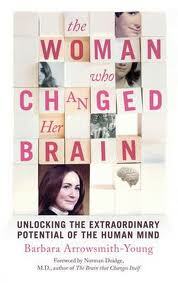 “Determine The Time” is reminiscent of an cognitive development technique invented by Barbara Arrowsmith-Young (whose book: “The Woman Who Changed Her Brain” is as amazing as it is inspirational). She developed this simple clock reading task, first to help overcome her own difficulties learning relationships between symbols (like the relationship between the big hand and little hand of a clock) and then started to roll it out as an entry level exercise for kids and adults with learning disabilities (making a dazzling impact on improving their cognitive abilities). It quite literally involves reading the time of a clock, but the twist in this particular game is that the clockface is rotated. 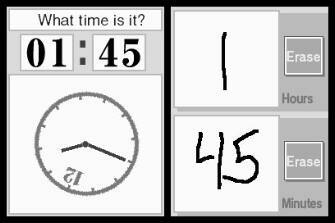 This requires you to do a “mental rotation task” – imagining in your mind’s eye what the clock would look like if it was the right way up – so that you can give the right answer. Such spatial rotation tasks stimulate the parietal cortex (finally something that benefits a brain area other than the prefrontal cortex!!) and, presumably, improvements in these mental rotation tasks will enable the parietal cortex to manipulate all sorts of other information in space. Incidentally, Einstein’s brain had a larger-than-normal parietal cortex and, given that this lobe is also critically involved in mathematical abilities, it is thought to account (in part at least) for his tremendous contributions to physics. 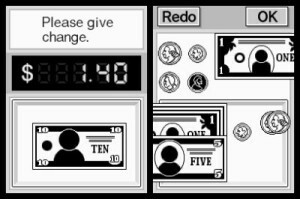 As well as rotating the clock in the harder levels Dr K becomes particularly devious by mirror reflecting the images as well. So your parietal cortex has to perform two sequential transformations reflecting it back and then rotating it the right way up again. It is a very simple idea, but genuinely, in my opinion, a tremendous work out for the parietal cortex. I am aware that so far the brain games I’ve reviewed are all on the Nintendo DS. 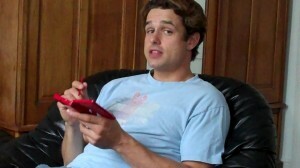 I am also conscious that it may seem that I am in some way biased in favour of the Nintendo DS. Both are perfectly reasonable observations. For the record the true reasons that, so far, I have only reviewed titles on the Nintendo DS are quite simply that a) I happen to own one, b) positive outcomes from brain training is only possible if you play it regularly and intensively and c) the smartphone I happen to own is not optimized for gameplay. For brain training to have even the slightest chance to yield genuine benefits it must be undertaken regularly, intensely and for long periods of time. In my opinion convenience is therefore a prerequisite of any good brain training game, thus I favour options that enable people to fill dead time in their daily routine with gameplay wherever they happen to be. I am aware that there are many home computer-based brain training games but as I personally feel that when I’m at my computer I should be working, not playing games – I suspect others feel the same way. This is why I haven’t reviewed the various online brain training offerings, instead focusing on those that enable you to brain train on the move. Not only is the Nintendo DS extremely portable and therefore convenient, I also happen to own one, so it is currently my device of choice for gameplay on the move (the only time I personally get the chance to get stuck in). I’ve been using a Blackberry for the last few years purely for the slideout keyboard which enables me to type without looking at the buttons. Once I’ve got over my distaste for touchscreen smartphone technology (I’m nearly there) I’ll start reviewing iOS / Android brain games. In light of this avowed intent I would be grateful if anybody out there would suggest any games marketed as Brain Training so I can give them the once over (rather than leaving a comment please drop me an email by clicking here instead). If your instinctive response was that: “brain training is good for absolutely nothing” – then you might not yet be privvy to all the relevant data. 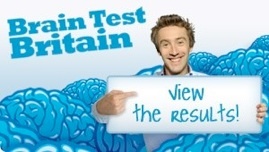 Scientific evidence backing the effectiveness of brain training is slowly but surely growing, , as far as I can tell. Swedish neuroscientist Torkel Klingberg has been at the forefront of research into computer-based brain training focused on increasing the capacity of working memory for over a decade. He and his team have identified a positive correlation between working memory improvements and IQ score. 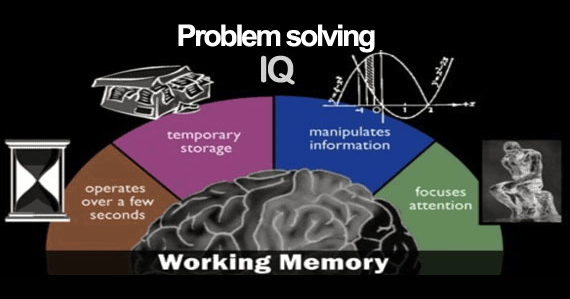 In other words the better your working memory – that is, the ability to hold several pieces of information in mind for long enough to complete a mental operation – the more “intelligent” you become. Well, to be fair, that’s not quite the whole story. IQ approximates to what we commonly think of as intelligence – but it is blind to a host of cognitive abilities that are very useful for the individual and highly valued in human society; like creativity, social skills, kinesthetic abilities and so on. 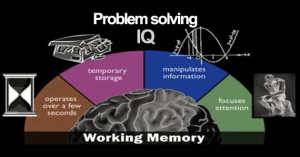 So a better way to describe it is that improving working memory leads to benefits in a variety of other cognitive abilities collectively known as fluid intelligence, which is vital for (amongst other things) solving problems. Whatever you want to call it, the bottom line is: enhancing these mental abilities leads to benefits at school, work and play. The last of these is the most pertinent to this particular brain post. There are lots of computer games out there which, often completely by accident, tend to improve cognitive functions that are relevant and useful in everyday life. 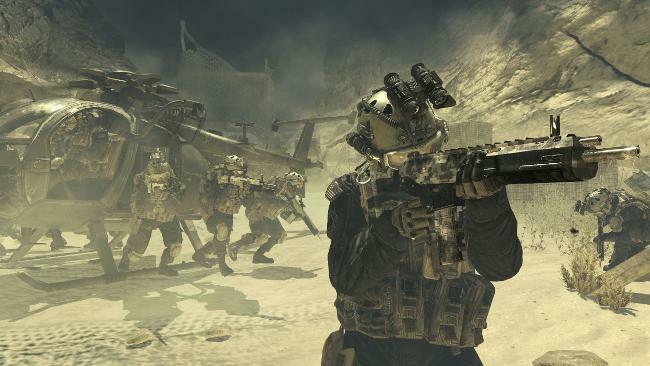 Parents who bemoan the hundreds of hours a year “wasted” by their children playing shoot ‘em up games may be cheered by the news that such games can actually improve visual perception . They are right to be concerned, by the way. Too much time spent locked into game mode displaces much of the time that could be spent cultivating soft skills. These broadly undervalued yet completely invaluable set of social skills can only be honed properly through regular, intensive, face-to-face communication. They make many aspects of personal and professional life that take place in the real, as opposed to virtual, world function so much more smoothly that society would be well advised to place a greater emphasis on the importance of ensuring they are cultivated at all costs. However, allotting a finite period of time each day to game play can be extremely good for your brain – so long as you play the right sort of games. 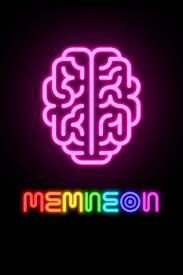 MEMNEON is a good example. Even Stephen Fry – the God-of-Twitter himself – tweeted that MEMNEON was driving him “delightfully dotty.” High praise indeed! The brain behind Memneon, Steve Turnbull, may feel that for me to suggest it is Simon for the 21st century would be selling it short. I would disagree. 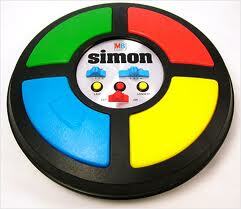 Simon was the original brain training device and as such was decades ahead of the game. And as with all things people will inevitably take a concept and move it on to the next level. Memneon has done exactly that – it’s like Simon on a high dose of amphetamines. Much tougher on the old working memory circuits. And of course it is by regularly challenging the brain’s cognitive capacities – for several minutes, daily, for weeks on end that eventually your brain reinforces connectivity between the relevant areas and abilities improve. 49 different possible locations for each consecutive disc illumination is sooo much harder to retain in working memory, before reproducing the patter, than just the 4 quadrants of Simon. 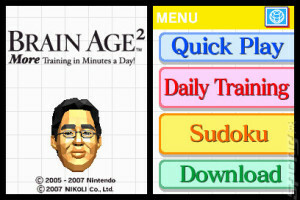 Now that the great potential for brain training is out of the bag all sorts of digital developers are falling over each other in their scramble to capitalise on the growing interest; first catalysed by Nintendo with their launch of Dr Kawashima’s Brain Age on the Nintendo DS. Uptake may have mellowed in the handheld digital console market since 2001 but PC-based subscription services that offer a suite of cognitive training games (like Lumosity) have very much taken over the reins. The BBC’s Bang Goes The Theory show made a big fuss of a Nature paper indicating that brain training was ineffective for the under 65’s. To make this newsworthy they, perhaps not surprisingly, felt the need to put some attention-grabbing spin on their non-findings by using the headline: “Brain Training Doesn’t Work” and I’ve written elsewhere about why I think it is too early to make such a bold statement. Finding no evidence to support a hypothesis is one thing. In this case I think that they hypothesis in question is: “computer-based brain training can improve cognitive abilities in a manner helpful and relevant to everyday life.” Disproving a hypothesis is quite another matter. Science is all about the balance of evidence. A good rule of thumb is that you should not believe anything reported in a single scientific paper until many other experiments have been done, ideally by other unconnected independent research groups, whose findings tally with the original. There is a lot of evidence out there that brain training does work in older people, but not so much – at the moment – that it pays dividens for younger people. But it’s early days. So I think people should take sensationalist headlines with a pinch of salt and wait to see which way the balance of evidence tips. The jury might be out on which aspects of brain training do and don’t work, but I think it is fair to say that there is every reason to believe that it has great potential to do you good and very little potential to do ill – so why not give it a go. 20 million subscribers who perceive some kind of benefit can’t all be wrong, surely?! Well they could be – but in the meantime the placebo effect is at least making them feel sharper, focused, able, etc…. Please get in touch via Twitter to let me know what you think of my brainposts. If you were kind enough to follow me you could also catch my thrice daily tweets, which headline and link to brain research breakthroughs from lay-friendly sources that I judge to be potentially compelling and relevant to all. Beat City is a fun music game that might even improve your brain! 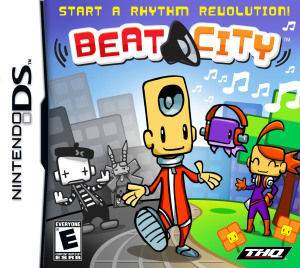 This is a review of “Beat City” – a Nintendo DS (2D) game that I believe has all the hallmarks of something that, although designed purely for pleasure, may actually improve brain function. A recent scientific review outlined several video games that, despite being developed only with gameplay and sales in mind, were nonetheless found to improve visual perception, sustained attention, task switching, rapid option selection and several other vital aspects of cognition. With this in mind I’ve been keeping an eye out for other games that might fall into this category. Kids who play a musical instrument boast better language development than their peers who do not. 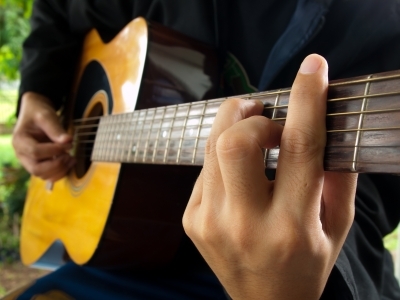 The Einstein Aging Study found that elderly participants who regularly play a musical instrument exhibited greater cognitive reserve than those that did not – helping them keep the ravages of Alzheimer’s at bay for longer. The upshot is that whether you’re very old, very young or somewhere in between, not only can playing a musical instrument create a torrent of activity in your brain’s pleasure pathways, but it can also be of long term benefit for a variety of different brain areas that support several cognitive functions. Beat City involves travelling around a comic book stylised world on a mission to bring music back into the lives of local inhabitants – by tapping along to the beat of a variety of electronic tunes. You are the “Synchroniser,” a brave inhabitant of Beat City who is hell-bent on freeing his fellow citizens from their banal tuneless existence. En route you encounter several bizarre characters with whom you must do battle by tapping, swiping and holding the beat in time to music of varying complexity. Although upon first appearances it may seem to be aimed at younger audiences, this game gets tough – tough enough to provide even those naturally musical people out there (even my girlfriend who reached grade 8 in three different musical instruments!) 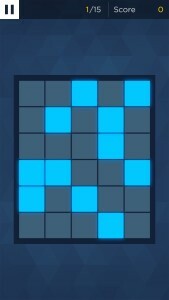 with a challenge as you progress through harder and harder levels. Reproducing a beat with accurate timing taxes a fair few different brain areas. The auditory cortex – distributed predominantly across the upper level of the temporal lobes (see diagram on the right) – crunches the soundwaves into what we actually hear through a division of labour across different patches of brain cortex which each extract different types of information. Firstly, the sound is separated out into its different frequencies at the cochlea in the inner ear and ferried to the primary auditory cortex (shown inset on the right). 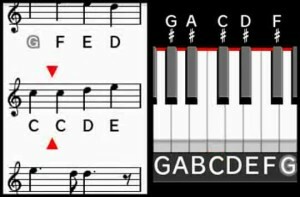 Some specialist areas are involved in establishing the rhythm. Others find and create the perception of melody. Functional units residing predominantly in left side of most people’s brain will extract the meaning from words in a song. 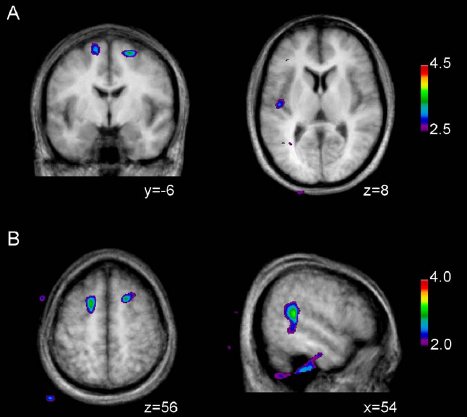 Others, mainly in the right half of the brain, extract the emotional tone of the music. Then there are the brain areas involved in tapping along to the beat: pre-motor regions of the frontal cortex plan the movements and the motor strip triggers them. In order to get the timing just right, the cerebellum – hanging off the back of the brain – finesses the signal on its journey from brain to finger muscles to ensure that the stylus hits the touch screen precisely in time with the beat as opposed to a little too early or late. 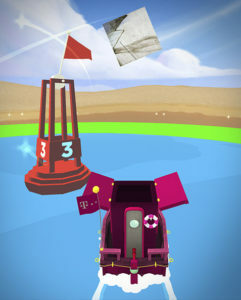 In Beat City, the accuracy with which you time each tap is indicated on screen by the size and colour of a musical note. To recap: different brain areas simultaneously extract different features from the sounds that reach the ear to creates sense of hearing in our everyday lives. Patterns in the sound are automatically extracted and we naturally anticipate when the next sound is likely to occur, enabling us to synchronise our actions according to the patterns in the sounds. This instinctive impact of rhythmical sound on movement is where the urge to dance comes from. Clapping, singing or playing a musical instrument requires different cognitive functions to operate simultaneously and interactively. Having to listen to, follow the rhythm of and anticipate changes in a musical score in order to producing carefully coordinated finger, hand (and for wind instruments: also mouth and respiratory tract) movements is a highly cognitively demanding task. Growth of extra connections (and therefore increased efficiency) in brain areas involved in perceiving sounds and producing accurately timed, precise, carefully coordinated movements are just the front and back ends of the brain workout. In addition, prefrontal brain areas responsible for working memory, anticipation, vigilance, error correction and many other cognitive functions are also put through their paces by virtue of having to ensure that the two processes are properly integrated. At the end of the day even if Beat City doesn’t inspire the desire to play a proper musical instrument, enabling the full brain-benefits of musical engagement to be earned, I believe it is nonetheless an effective way of challenging and thus improve your capacity for working memory, concentration and fine motor control that will come in useful in everyday life as well. In addition to these brain posts you can catch my daily #braintweet by following me on Twitter. This review comprises my opinions, both as a consumer and a neuroscientist, of Dr Kawashima’s Brain Training on the Nintendo DS. I have previously (http://www.drjack.co.uk/brain-teasers-brain-training/) outlined my view that brain training is simply a matter of teasing your mental faculties with a variety of word, number and problem solving challenges on a regular basis. In this regard, the greatest advantage of the Nintendo DS brain training over the old-fashioned (but quite possibly equally effective) books of crosswords and number puzzles, is its fantastic convenience and flexibility. You can carry around with you literally thousands of mentally-taxing brain teasers for use during your daily commute, or to the far corners of the globe, and it will take up no more room in your baggage than a small book. I have also previously described (http://www.drjack.co.uk/does-brain-training-really-work-by-dr-jack-lewis/) why I think that, despite the BBC’s headline-grabbing publication of research suggesting that “BRAIN TRAINING DOESN’T WORK”, I sincerely believe that the jury is still out on that issue. So below you will simply find my considered opinion on how this game rates – as a way to while away some spare time in a manner that probably won’t change your life, but certainly won’t do you any harm and might just sharpen up some very basic, but fundamental, cognitive abilities. 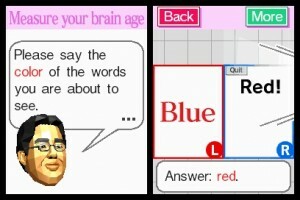 I promised to review Dr Kawashima’s “Brain Training – How Old Is Your Brain” a long time ago. Why did it take me so long to deliver on this promise? To be honest, it took me months to clock up enough days of brain training to finally unlock all the games. At the very beginning you have access to only 3 (quite dull) brain training games and then, as you complete more and more days of training, you are rewarded by being given access to more and more of the games (most of them much better than the first 3). Slightly annoying, perhaps, but ultimately an unquestionably good strategy for incentivising more regular training. Despite being very curious to investigate this brain training phenomenon I only managed 1 session in Mar, 1 in Apr, 3 in May, 0 in June, 4 in July and 11 in Aug. It is interesting to note that the inspiration for training more regularly at the end of July was that this was the very first time I had encouraged someone else to give it a go. When I saw what my girfriend had scored I found that I was suddenly powerfully motivated to keep up my training, whilst over March-June my efforts were distinctly half-hearted. Having more than one person using the same console is clearly the key to nurturing motivation. Humans are naturally competitive and so if it worked for me it should work for you too. So my first piece of advice is, once you’ve got the hang of it, be sure to get friends and family having a go too. I know exactly how often I trained over the past few months thanks to the scrollable calendar feature, which automatically stamps each day that you switched on and played. Not only does this allow you to see, at a glance, how dedicated (or in my case slack) you have been with your training, but the 3D floating head of Dr Kawashima, after greeting you at the beginning of each training session, takes it upon himself to praise or berate you according to how long it’s been since your last visit. My first impressions of the game were that it was better than I had expected. I was surprised and happy to see that the floating 3D head’s opening presentation explaining the concepts of brain training included real fMRI brain data to help illustrate some of the key points. I was impressed that Nintendo were brave enough to include some real science, trusting that their customers would not be scared off by it. Quite courageous of them. The very first session involves a preliminary brain training game to establish your inital “Brain Age”. Determined to nail it I was nonetheless shocked that I managed to get the best possible “Brain Age” of 20. All those decades of education were not wasted then! Before you start hating me for being a smart alec, let me reassure you that my “Brain Age” soon shot up to my real age and well beyond over the months that followed. The point is that this “Brain Age” score is pretty arbitrary to say the least – it shoots up and down like a roller coaster because it is based entirely on your current performance and doesn’t seem to take any of your previous performances into account. It is merely there to provide you with the impetus to keep on training. Trust me it works – it took me months and months to nail a “Brain Age” of 20 again. And then I never wanted to do it again because I knew I was almost guaranteed to do worse. Whatever your best ever “Brain Age” is – seeing a considerably worse one by your name each and every time you switch on to play makes anyone with a grain of competitiveness want to step up and take it on. 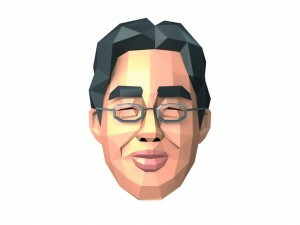 Over the weeks and months I developed a distinctly love/hate relationship with Dr Kawashima’s floating head. Some of the silly things he says, like: “What wonderful results! I might start crying here…” genuinely made me chuckle, on more than one occasion (invariably drawing quizzical looks from whoever happened to be sitting opposite me on the train). On the other hand, some of his advice on how to keep your brain in tip top condition is very weak and the extremely repetitive observation that doing calculations/reading out loud/drawing from memory/moving the stylus from target to target/counting syllables etc. etc. will “activate your prefrontal cortex and improve your general brainpower” becomes extremely tedious. But on balance, this is one of just a handful of pretty minor gripes. 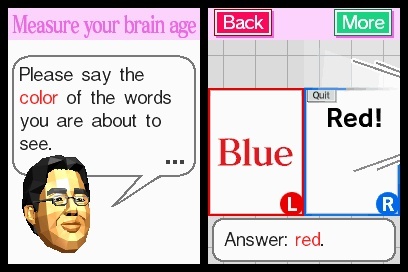 Overall Dr Kawashima’s Brain Training on the Nintendo DS is an extremely smart, convenient and quite technologically-advanced little game that positively encourages people to take an active interest in the health of their brain. The Daily Training games consists of a variety of ways to tax different clusters of brain areas involved in different cognitive functions. 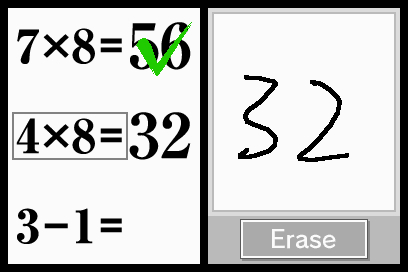 “Calculations” involves performing simple addition, subtraction or multiplication problems that are displayed on one screen and whilst you use the pointer to scribble your answer on the other screen. The aim is to complete a predetermined number of sums as quickly as possible and the punishment for a wrong answer is a (quite severe) time penalty. The format of this challenge is unimaginative to say the least and in the first instance makes you feel like you’re back in primary school. But by the time my training was completed I had performed so many rapid calculations that, as with all things, I improved in leaps and bounds. Being able to perform simple calculations extremely quickly is a useful skill to have and comes in useful in everyday life. Trying to work out if you have enough money to pay for the items you are about to take to the till is one example. So I didn’t resent being made to feel like I was back in primary school too much. I’ve since caught my local shop keepers short changing me once or twice now as a result. I’m sure it was unintentional on their part, but I simply wouldn’t have bothered adding it up in my head if I hadn’t been put in the habit by “Calculations”. Later on you get to unlock one of the mystery games that takes the maths challenges to the next level by making you remember pairs of answers for long enough to perform calculations upon the correct answers to previous calculations. Pretty challenging and completely impossible if you are on the way home after a long session at the pub! My two least favourite were probably “reading out loud” and “syllable count”. If I want to read out loud I have a plethora of my own books to choose from. And how anyone but rap artists might benefit from honing the ability to count the syllables in a proverb beats me. It may exercise the brain areas involved in reading and producing words, or in the parcellation of words into smaller chunks, and could therefore potentially yield some improvement in these functions under normal conditions, but they are a pretty dull way to pass the time. “Head count” – on the other hand, is a different matter. You have to keep track of a hoard of stick men scuttling into and out of a house, which gives the old working memory a genuinely good work out. This is because it requires you to constantly update the number of stick men currently within the house despite the frantic comings and goings. On hard mode this game is particularly challenging, as the stick men leave and arrive not just through the side doors, but through the chimney as well, which means you have to count the vertical comings and goings as well as the horizontal. Another favourite is “Low to High” – where a series of carefully spaced numbers are flashed up on the screen for a very brief period of time and, thanks to the wonders of iconic memory (the impression left on the brain by a flashed image), you find yourself able to touch the squares within which the numbers were displayed just moments before, in the correct order from lowest to highest. If you get it right an additional number is added in the next round to make it progressively more challenging. Once you get up to the heady heights of tackling 7 or 8 numbers it is really hard! A very enjoyable game and one which helps to develop a potentially useful cognitive skill of extracting information from briefly viewed images – excellent for anyone who wants to become a spy, or work in film or TV for that matter. I was very surprised to find that the Nintendo DS was equipped with voice-recognition software that actually works fairly well. This is essential for a classic psychological mind bender called the Stroop test, which exercises brain areas involved in inhibiting impulsive responses. It involves a colour word being presented on the screen e.g. “red” or “green” or “yellow” or “black”, but the meaning of the word must be ignored and instead the colour that the word is written in must be stated out loud. In other words if the word “blue” is presented in red-coloured font, your brain has to work extra hard to suppress the temptation to say the word “blue” in order to allow the correct response to be uttered i.e. “red”. I must admit that the first time I tackled that particular game I found myself thinking: “will this gadget really understand me?” Despite my doubts I was impressed to find that it could recognise most of my speech. Yet if there is any background noise it is completely hopeless, particularly on the train. I would definitely recommend experimenting with different ways of saying the words to help you figure out how best to deliver the word to ensure it is properly recognised. This game is one of the handful of tests used to define your brain age – an extremely arbitrary scale by all accounts – but when your brain age is given as 62 because you wasted 3 solid minutes repeating the word yellow over and over again in voice steadily becoming increasingly loud and irritable you may find that putting some time into finding a voice that it can register accurately pays dividends in the long run. The same goes for experimenting with writing numbers in such a way that no matter how fast you try to write, it is always correctly registered by the software. I cannot tell you how frustrating it is (and how often you find yourself getting frustrated in this way, particularly when on the move) when you see the sum 2+2 and your scribbled “4” is misread as an “8”. A 5 second penalty seems pretty harsh when you knew the right answer but couldn’t get the damned thing to recognise it properly. Another game in the battery of tests that defines your “Brain Age” includes a memory test. You are given 3 minutes to memorise a long list of words and 2 minutes to recall them. I think Nintendo missed a great opportunity here as there are some great mnemonic strategies that they could have offered here to help you improve memory performance more quickly and to a greater degree. Now that really would have been bona fide brain training! As I already know these memory tricks, I found that this test was an absolutely brilliant forum in which to practice creating memorable links between a random list of words. This is the real challenge in using memory tricks – being able to dream up a potent image of an imaginative scenario whereby two successive words are intertwined and then get on quickly to the next pair of items. If I hadn’t been playing this game I would not have had so many opportunities to practice this extremely useful skill and would not have improved to the point of being able to recall as many as 36 of the 40 words. Importantly this transferred directly into a benefit in my day-to-day life as I was able to quickly dream up some mnemonic links between 10 facts that I wanted to mention in a meeting just 15 minutes before the meeting was due to commence. All that brain training had clearly boosted my memory-making faculties as I recalled every fact effortlessly, which made a good impression on the audience and saved time shuffling through notes and papers to find the relevant information. I’ll share some of these mnemonic tricks with you in my next post so you can try it our yourself. So watch this space!